COMSOL Multiphysics® version 5.2a, update 2 introduces the new Rotordynamics Module. This add-on to the Structural Mechanics Module allows you to model components and parts in rotating machinery where asymmetries and the rotation can lead to instabilities and damaging resonances. Read more about the capabilities and features of the Rotordynamics Module below. The Rotordynamics Module simulates the behavior of rotors and their components from applications involving rotating machinery. This can include the natural frequencies of such assemblies, as well as in situations where rotor operation can lead to critical speeds and resonance that may or may not depend on unbalances. 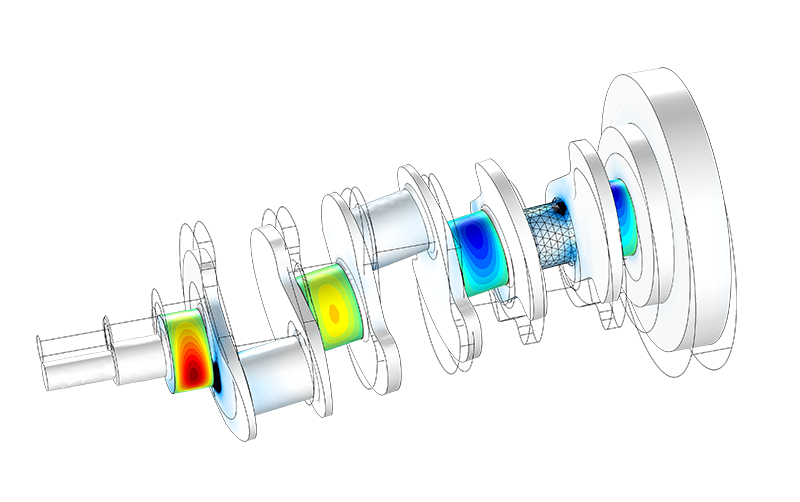 Such simulations are used to investigate rotating parts in appliances from the automotive, aerospace, power generation, electrical, and household goods industries. Now available as an add-on to the Structural Mechanics Module, the Rotordynamics Module enables you to analyze resonances, stresses, and strains in rotors, bearings, disks, and foundations, so you can keep conditions within acceptable operating limits. The pressure distribution in the lubricant of the bearings and von Mises stresses analyzed using the Solid Rotor interface. Solid Rotor: Through the use of solid elements, you can use this interface to model full 3D geometrical representations of the contributing parts to a rotating machine's assembly. Although computationally expensive, nonlinear geometric effects can be included, and you can also account for spin softening, stress stiffening, as well as deformations in journals and mountings. Beam Rotor: This interface allows for faster and less computationally expensive solutions by defining rotors as beams, and the rotating machineries' components as points. Inherent properties about the rotor, such as cross-sectional surface area and moments of inertia, are used to defined the physics in this interface. You can separate the axial, bending, and torsional components of your rotordynamics analysis and their response according to a rotor's angular speed. Hydrodynamic Bearing: For the full modeling of hydrodynamic bearings, including the effects of the lubricating film, this interface can be used to just model the bearing's properties or be combined with other interfaces (see below). By solving the Reynolds equation, you can analyze the effects of the lubricating oil between journals and bushings for the following hydrodynamic bearing types: plain, elliptic, split-halves, multilobe, tilted-pad bearings, or user defined. Solid Rotor with Hydrodynamic Bearing: For modeling a 3D rotor, based on solid elements and using the Solid Rotor interface, and hydrodynamic bearings, based on the Hydrodynamic Bearing interface. Beam Rotor with Hydrodynamic Bearing: For modeling an approximated rotor, based on beam elements and using the Beam Rotor interface; and hydrodynamic bearings, based on the Hydrodynamic Bearing interface. In addition to hydrodynamic bearings, the behavior of contributing components can also be included as lumped parameters in a number of specific features. This includes journal bearings, thrust bearings, and foundations. The Structural Mechanics node in the Model Wizard showing the new Rotordynamics subnode and its contributing interfaces. When using the Rotordynamics Module, what is static and what is dynamic is by and large determined by an observer in the frame that is corotating with the rotor. In a general structural mechanics setting, different forms of dynamic analyses are used when inertial forces cannot be ignored. As the rotordynamics interfaces are formulated in a corotating frame, some of the inertial effects are already taken into account as static loads. Thus, a rotor that spins under conditions that are stationary when viewed by a corotating observer does not require a dynamic analysis. This simplification is one of the fundamental benefits with using the Rotordynamics Module. On the other hand, a load that is fixed in the spatial frame, like gravity, will have a harmonic variation when seen from the corotating perspective and provides a dynamic excitation. 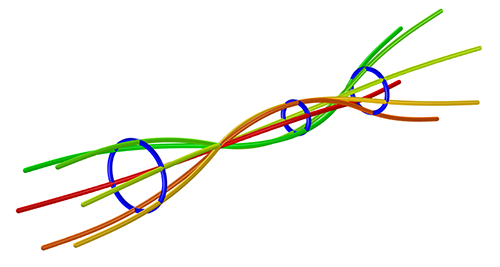 A whirl plot showing the third mode of a supported rotor with two bearings at the ends. Whirl plots: Plot the mode shapes of the rotor rotated about the rotor axis at discrete rotation intervals. Campbell plots: Plot variations of the eigenfrequencies of the rotor with respect to rotor speed. In forward whirl, the eigenfrequency increases with the rotor speed, whereas in backward whirl, the eigenfrequency decreases with the rotor speed. Waterfall plots: Plot variations of the frequency spectrum and amplitude against the angular speed of the rotor. Orbit plots: Plot 3D orbits of certain points on the rotor, which often relate to a component's position, such as disks, bearings, etc. 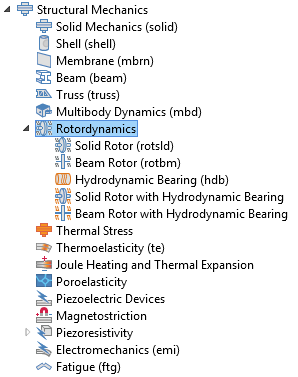 View the Rotordynamics Module product page to see what else you can model. 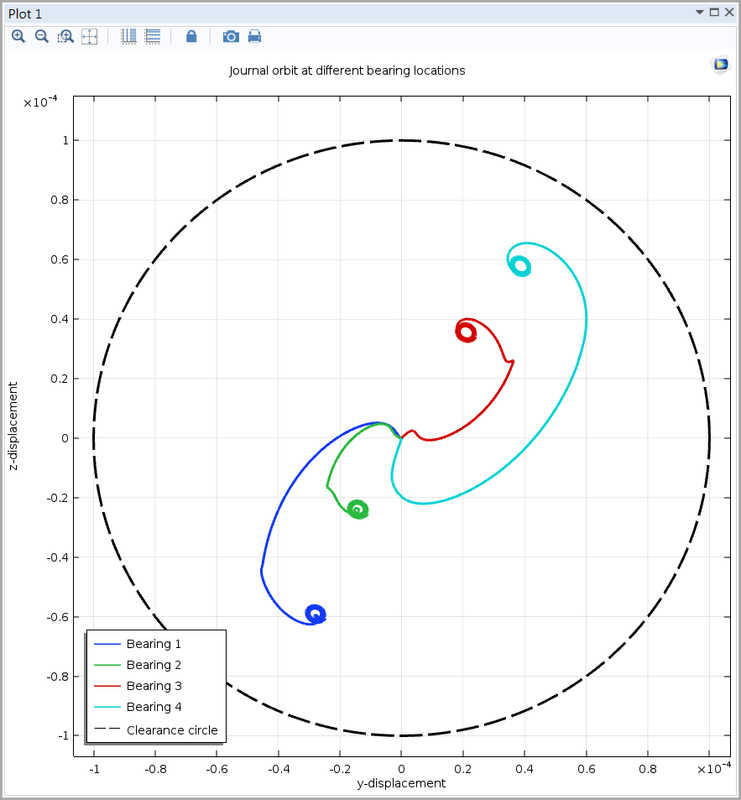 Journal orbits corresponding to a rotordynamics analysis of a crankshaft.